LG Electronics announced its newest flagship smartphone, the device is today's (Samsung Galaxy S4) most powerful Android OS based smartphone called the LG Optimus G Pro. 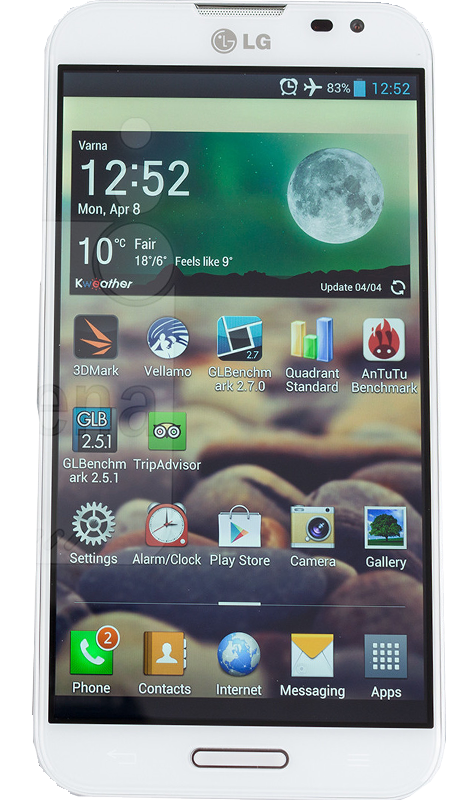 The LG Optimus G Pro is an upgrade, brings a new design and a large 5.5-inch full HD display. With 5.5-inch display the LG Optimus G Pro have rounded shape, glossy, plastic back panel. On the front surface there is a physical home button and two touch buttons fo back and Menu functions which is placed left and right side of home button. There is no chance to use the phone with just one hand. However, when it compared to Samsung's Galaxy Note 2, the LG Optimus G Pro is smaller with (150.2 x 76.1 x 9.4 mm) and weighs 172 grams. The phone have 5.5-inch Full HD IPS display. The Display provided by LG is True HD or say amazingly sharp with resolution of 1920 x 1080 pixels and it have pixel density 401 pixel per inch (ppi). While in Samsung Galaxy Note 2 have HD display with just 276 ppi pixel density. The phone is really fantastic, the phone is equipped with 13 Megapixel rear camera and 2.1 Megapixel full HD camera. The LG Optimus G Pro boasts dual recording means it can record video with both cameras simultaneously and the phone is packed with virtual reality panorama feature which allows 360 degree viewing both by vertical and horizontal environment. Fastest smartphone is flagship with a Qualcomm Snapdragon chip 1.7 GHz Quad-Core 600 processor, it runs on Android 4.2 Jelly Bean OS. The phone have 32 GB internal storage and 2 GB of RAM. Other features include Wi-Fi Standard 802.11 a/b/g/n, NFC, Infrared, Bluetooth v4.0, Quick remote, hotspot. The Phone have a large 3140 mAh battery and much more. LG Optimus G Pro is priced at Rs 42,500/-, $200 with 2 year of contract on AT&T.